Billy Roberts and the Rough Riders are a growing phenomenon among music purists. The Australian trio consisting of Billy Roberts (Vocals and guitar), Alex Quinn (lead guitar and production), and Rory Facione (drums), possess an admirable reputation for their work ethic and endearing rock sound. Greenbah, the band’s latest effort and third album is refreshing in its approach and is sure to turn some ears. 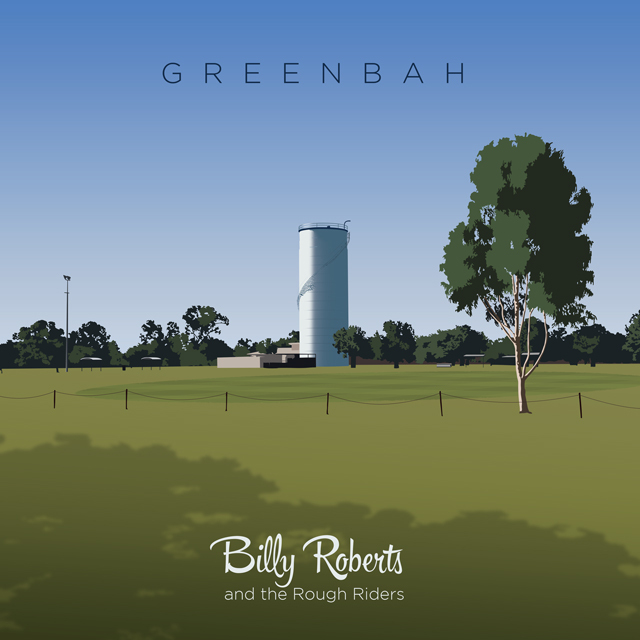 Thanks to some amazing instrumentation of the behalf of Billy Roberts and the Rough Riders, Greenbah has a pleasant timelessness that is interwoven within a hazy atmosphere. The album’s sound fits well in the genre of country rock with some additional influences of folk and garage psychedelic overtones, reminiscent of the English band Arzachel. The Greenbah album opens up with a crisp track, entitled, Old Friend. This song has a very inviting rhythm with simple grooves that allow listeners to really absorb the sentimental lyricism and enjoy the ride. Old Friend proves to be the greeting card for a great album. No One Knows Me is the next track on the album and an easy favorite. This song is a pure rock haven, that’s very nicely done. It’s a lucid tune and a steady fingerprint for the rewind button. Roberts provides an excellent vocal for an uptempo track that music fans are dying to introduce to their mothers. The guitar leads and bass provide additional gems to one of the finest cuts on the album. Only One follows, a beautiful love song marked by its bright melody and hopeful mood. The band really shine through on this track with a great acoustic guitar and piano chords in dialogue for a new love affair. The appearance of an electric guitar break is quite tasteful as well. In direct contrast to Only One is Blood and Bones, a song that spells out a lover’s rant. Blood and Bones is an exceptional track that supports the album’s continuity. Greenbah stretches of a landscape made from eight tracks. The depth of the album unfolds as the listener ventures forth further into the album. Tracks like Sinner show a tremendous quality about the bands ambitions and perfection of a distinct sound. Little Johnny is another gem and a memorable experience in the progression of the band’s repertoire. Interestingly, Little Johnny is a break from some of the traditional formulas on the album, which can also be said about other songs appearing on the latter part of Greenbah. Ed’s Song is a clever way to bring a nice ending to the musical journey of the Greenbah album, wherein the final track is somewhat similar to the project’s beginning. Billy Roberts and the Rough Riders have made a tremendous stride in their careers upon the release of Greenbah. A near perfect album is the great validation of the fruitage of hard work. Thank you for the music you have given us!